We crossed into Uruguay from Agentina at Paysandu, a city a lot like the US in the 1940s. I really had the feeling I had stepped back in time. In places such as rural Peru which are far less developed, it does not feel as much like a different time but as a different world. Paysandu was the same world, but a different time. Paysandu is a small city of about 100,000 inhabitants, but with the bustle and business section of a city a quarter that size in the US. Life was slow, but reasonably prosperous. No chain stores or chain restaurants - just owner operated places like it once was so long ago. That can still be found in small town Iowa, but even there the old ways are being replaced by creeping suburbia. But in Paysandu it still feels like the proverbial good old days. Even the cars add to that feeling. I've never seen so many antique (1930s and 1940s) cars on the road as in Uruguay. I took some rough counts and figured out that ten to fifteen percent of the cars on the road in Uruguay are very well cared for antiques. We found lodging in a little place called th Victoria Hotel on 19 de Julio, the main street. It was run by an older widowed Lithuanian woman. She had spent her entire life in Uruguay though, and was thoroughly Uruguayan. The furnishings and decor of the hotel were very much like that of forty years ago small town USA. Uruguay is a very pleasant country. There's nothing to see here, or at least nothing the scale of Tikal or Iguazu. But its just the place for a relaxing holiday among pastoral countryside, Victorian cities and towns, and excellant food. During the summer the beaches are said to be among the best in the world, but crowded with Argentine tourists. The food, though, is almost reason in itself to make a trip to Uruguay. I have never eaten better at such a value. In many ways it is similar to Argentine food, but is priced more reasonably. The national dish of Uruguay is beef, and huge slices of it are charcoal grilled on a spit. In a restaurant they simply cut off a slab to serve. It is weighed and the customer pays by weight, but a very reasonable price. A pound costs around a dollar. As in Argentina, this is a country where the salads are safe,to eat, and they make a nice side dish to either the beef, or the other main Uruguayn dish, pasta. Pasta in Uruguay is made fresh every day. One shop will have a sign out that they have ravioli today, another spaghetti, a third noquis (gnocchi). The Lithuanian woman who ran the Victoria Hotel had a son living in the US. She visited him once for a month and was shocked to find it impossible to buy fresh pasta - only that horrible dry stuff as she put it. So she made him fresh pasta every day of her visit. She can visit me sometime! I am uncertain why lots of dry Argentine pasta was brought into Uruguay by so many women on our bus from Argentina, but I speculate that it is cheaper for the poorer people. No restaurant in Uruguay would serve dry pasta, nor would anyone serve it to a guest. Spaghetti is either served with sauce, or plain with dry chopped spinach on top. Ravioli was either stuffed with meat and served with a sauce, or stuffed with spinach and served plain. Noquis were served with or without sauce. While pasta without sauce may not sound appetizing to some, that is only because they have never eaten it in Uruguay. I soon preferred it without the sauce, just a few dried herbs on top, so I oould better enjoy the fresh pasta. Pasta is a main dish in Uruguay because that country received many Italian immigrants in the late 1800s and early 1900s. Many Americans who have been to Italy have said they found Italian pasta much too greasy, In Urvguay the pasta is not greasy at all, only superb. In Uruguay meals are usually accompannied by a local red wine. Besides the beef, there are a variety of other meat dishes including lots of sausages. I can t get by without a mention of morcilla dulce - a type of blood sausage made with ground orange peels and walnuts. I've never eaten anything like it and it is delicous. To finish a discussion on Uruguayn food, I must mention masas surtidas. These are little bite size pastries sold in bakeries. There are many different types, some moist, some dry, some flaky. One simply tells the clerk "Give me one of those, one of those, and two of those ..." The clerk puts the mixture on a scale and they are sold by weight. They are most of the reason I gained weight in Uruguay. Paysandu has four medium wave radio stations, and at the time of my visit an experimental FM station which I was told about but never heard on the air. 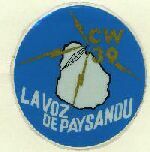 The oldest station in Paysandu is CW33, La Voz de Paysandu, founded in 1924. It was soon followed by CW35, Radio Paysandu. Exactly how developed Uruguay is, and was, as a nation can be seen by the fact that Paysandu, the second city and a minor one at that, had had two radio stations for several years before the first radio station in Central America made it on the air. Uruguay was just barely behind thc US and ahead of many European countries. CW39 operates from its original location, about ten blocks from the central plaza along 19 de Julio. It is a spacious house, now given over to the radio station. The house originally belonged to station's now deceased founder and director, Miguel Penna. The current manager, Eduardo Estefaell gave me a short tour, typed out a verification letter for my report made up the street in the Victoria Hotel, and showed me his collection of reception reports from Scandinavia. Yes, with 1.5 Kw on 1320 khz, CW39 has made it through to Scandinavia on several occasions. CW35 is also on 19 de Julio street, in the second story of one of the older buildings. They had a great old fashioned neon sign which was never lit up. They, too, had received European reception reports for their five kilowatt transmitter on 1240 khz. Also on 19 de Julio, about halfway between the two, was Radio Felicidad, which was founded in the 1940s. It has a two-story high waiting room with a decaying stained glass skylight at the top. Before it was a radio station, I suspect the building was a hotel - it looked like it should be a hotel. Radio Felicidad, too, has received European reports, but its 1420 khz must surely have more power than the one hundred watts listed in the WRTH. The fourth Paysandu station is Radio Charrua on 1540 khz. This station is very recent and completely automated. It is located very close to the main plaza, on Leonardo Gomez street, in one of the few modern buildings. I walked into the offices several times, but there was never anyone either in the offices or in the studio as far as I could see through the window . Probably the staff took advantage of the automation and went out to get masas surtidas. From Paysandu to Montevideo we traveled by bus. Urwguayan buses, still a bargain by American standards, are the most expensive per kilometer in South America. Quality wise they are only surpassed by Chilean and, I'm told, Brazilian buses. Montevideo is a bit like a huge Paysandu with taller buildings and more traffic. While not as cosmopolitan as Buenos Aires, it is a city. Buenos AIres is much more interesting to visit, but I think I would rather live in slower paced Montevideo. We spent several days in Montevideo, including an overnight trip to a small town called Minas to the east. Some time was spent in touristic pursuits, such as a visit to the Gaucho Museum, one of the best of the trip. We also enjoyed seeeing a Dudley Moore picture and spent lots of time browsing in the jewelry markets - Uruguay produces a lot of minor gemstones. Also time was spent checking out record stores. Current LPs were rather high for Latin America at five dollars. Above that customers paid another dollar if they wanted th record sleeve. If one were on a budget its possible to buy a record without the sleeve, and presumably the sleeve without the record. We bought an album, with sleeve, by Uruguay's best known folk group, Los Olimarenos. Montevideo is also an excellant place to look for bargains in the closeout bins. We picked up an older John Denver album for only a dollar and an album of Ukrainian Christmas music for only 30 cents. We figured we couldn't go wrong for 30 cents. Radio station visits were on the agenda for Montevideo. Radiodifusoras del Uruguay, which runs Radio El Espectador (11835) and Radio Libertad Sport (6045) was first on the list. I really wanted to meet manager Jorge Cubilo. Since the WRTH gives the street address, there was no problem finding the station - I had already walked within a block of it several times. They have their own new three story building. The station occupies the top two stories. The first floor is empty. At the top of the stairs was a receptionist and off to the left was a huge room divided into cubicles filled with hardworking people. Very professional and business like. How dare I ask to see the manager of such an operation I thought. Still, I did, and being a listener from overseas was all it took. Jorge Cubilo was out to give me a tour himself in ten minutes. The reason I wanted to meet Jorge Cubilo is that I knew he had been associated with Radiodifusoras del Uruguay for many years. He looks just like a respected grandfatherly businessman. He still runs this radio station. The younger members may do the work, but he is certainly the boss. Everyone respected him. He took me around to the studios, record library, news room, and the advertising office. News is one of the mainstays of Radio El Espcctador, and large part ofthe staff work in the news department. They also receive wire services from overseas. Sports is also important and a large part of the programming on Radio Libertad Sport is, of course, sports. Senor Cubilo took me to one room where they had several old Hammurland and Hallicrafters sets used to monitor other stations. These, he told me, are the kind of radios he likes. These date from the days when radio vas king. Radios made in the way radios should be made. Grandfatherly Jorge Cubilo standing by those old radios - I will always think of him when I think of broadcasting in Uruguay. Visiting the government operated SODRE was a bit more trouble. When I arrived at Mercedes 803, the suppossed address of the station, I found that the entire block had been demolished. AlI that remained were piles of brick and other rubble. I went into a nearby office and asked if SODRE had been in that building. The secretary confirmed that SODRE had been there, but had moved just recently. The old address was still in the phone book, and she didn't know where they had moved to. So she started looking up different government offices in the phone book and calling them up until someone knew where SODRE had gone. SODRE had apparently changed phone numbers too, as theirs was disconnected. As it turned out, the station was only two blocks from our hotel and I had walked by it several times. However since San Jose 1115 was only a temporary location, there wasn't a sign up. Walking back through the hallways it was obvious that they had moved quite quickly into the partially finished building. The offices were finished, but the halls and stairways were not. The international service was headquarted for the moment in the archives room - that just happened to be where Fernando Manfredi had his desk, and he was the person in charge of it. SODRE is the national government operated radio station of Uruguay, the evuivalent of the Radio Nacionals found in most other countries. As such it operates mainly on MW and FM for a national audience, and to some extent on shortwave for Uruguayanas abroad. The international service is a very low priority. SODRE was going through several changes, mainly due to the return to democracy in Uruguay and freedom in the media. The old building had been demolished so that a new one with modern studios and facilities could be built. A not very apparent change was the change in the station name. Although the initials have stayed the same, the name hasn't. 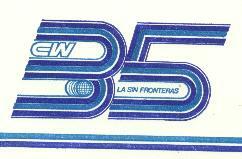 The old name had been Servicio Oficial De Radiodifusion Electrica. The new is Servicio Oficial De Radiotelevison y Espectaculos. More modern sounding, I guess. Fernando said the international service was temporarily suspended because the shortwave transmitters were not being used. The international service is not an organized department or division of SODRE. Rather, several people with other positions work at it part- time. Fernando coordinates things and also tries to see that the overseas mail gets answered. They have an attractive white, blue, and gold QSL card with an Uruguayan flag superimposed on a map of South America. The don't receive much mail, but that is to be expected for such equipment, he said. The transmitters are low power and several decades old. However, SODRE had recently purchased some six-year-old used transmitters, still low power, but much newer and in better condition. Once the engineers finished checking them out, he said, they would resume broadcasting on shortwave. We found the Uruguayan people always friendly, and we often had conversations with them in the shops, parks, and museums. In Uruguay, by law, all museums are free. It is a practice which encourages people to go to museums. Each time we visited a museum there was a staff member there to give us a complete tour and answer all our questions. No tip was expected because this was their job. Considering Uruguay's museums with the tour we had in San Pedro de Atacama, Chile and I'd say the free guides were better than any I've ever paid for. After Montevideo we went westward along the coast to Colonia, a town originally founded by the Portuguese but later captured by the Spanish. The old area of town, which dates to the 1600s, is preserved as a national monument and includes two seperate museums of the Portuguese and Spanish colonial periods. The town also has a municipal museum with one of the best stuffed bird collections I've ever seen. It was originally a private collection. I stopped in at Radio Colonia, CW1 on 550 kHz, to verify a report I had made earlier in Paysandu. They too had received reports from Europe, despite using only one Kw. Obviously Uruguayan MW stations make it quite well to Europe. After Colonia we returned to Paysandu. We had been traveling constantly over the previous weeks and decided it was time to take three days to just relax in a peaceful place. The Victoria Hotel in Paysandu was the place. We learned that on our last night in town, Los Olimarenos were to give a concert in Paysandu's huge basketball arena, which seats several thousand people. We bought tickets for about a dollar each. Everyone was excited. Los Olimarenos had been in political exile for several years and were only now able to return to a democratic Uruguay. The concert was part of a welcome back tour across the country. The songs they played were all good, with lyrics largely nationalistic and anti-military. That's what fit the mood of Uruguayans at the time. We left at intermission though because it was so crowded and people were smoking. We just couldn't stand the thick clouds of smoke any longer. Unfortunately the nonsmoking movement has yet to take hold in Latin America. The followinng day we took the bus to Salto, north of Paysandu and also along the Uruguay River. A pleasant town, though not so much as Paysandu, it was worth an afternoon's walk. Concordia, Argentina is directly across the river from Salto, however the nearest bridge is acrosss the Salto Grande dam, about twelve miles to the north. Therefore most local people take the regualrly scheduled launch service across the river. That was the first time we crossed an international border by riverboat. This article is copyright 1986 by Don Moore.